Many thanks to our friend and animal rescue volunteer, Susan Oney for sending in a picture of her "Three Amigos". 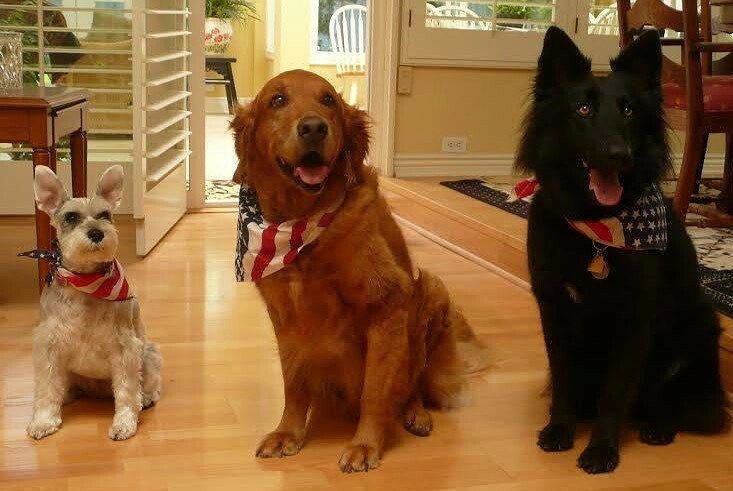 Look how adorable these three posed for their July 4th Photo opportunity! "Right now all of our pets are doing really well. They're happy and full of energy with shiny coats which I totally attribute to your nutrition guidance - good foods and supplements. I'm attaching a picture we took on the Fourth of July. We call them "The Three Amigos" because they all get along so beautifully. It was one of those rare moments when they were all being very obedient and cooperating with the camera! My dogs use several of your products: Kayla (Belgium shepherd-3 yrs old) has a sensitive stomach so I give her K9 Digestive Enzymes and Power Probiotics. Ben (Golden retriever-10 yrs old) has a bad hip from an accident when he was a puppy so he takes Amazing ArthoSoothe, Curcumin Complex and Vitality Now. Molly (Schnauzer-12 yrs old) has skin issues so she gets Power Probiotic and K9 Yeast Defense. Obviously, as you can see, we are very satisfied Ask Ariel customers!"